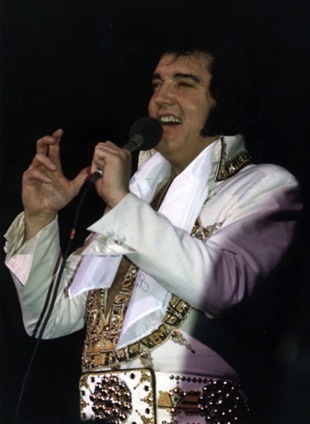 In June 1977, a group of over 250 Elvis fans crossed the Atlantic to see their idol perform in concert. 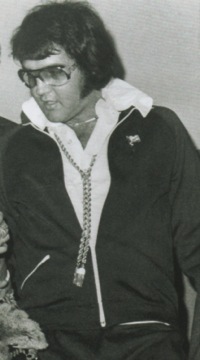 The Elvis Presley Fan Club of Great Britain sponsored the excursion, and while most of the travellers were from the United Kingdom, others from Denmark, Belgium, and Ireland also came on the trip of a lifetime for Presley European fans. The group’s timing was both fortunate and tragic. 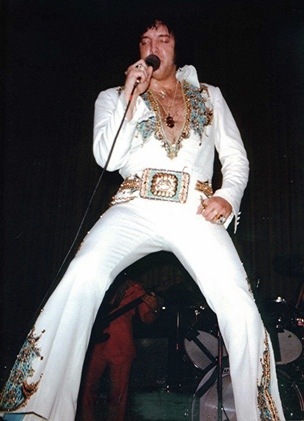 The fans from abroad were fortunate in being able to see Elvis on stage in two mid-West American cities. The tragedy was that, of the nearly 1,500 stage shows Presley played during his 24-year career, the European fans saw the last ones he performed during his lifetime. Elvis died less than two months later. Elvis started his final stage tour, a 10-day swing through the American heartland, in Springfield, Missouri, on June 17, 1977. Following were stops on successive nights in Kansas City, Omaha, Lincoln, Rapid City, Sioux Falls, Des Moines, and Madison. The final two shows, both attended by the European tourists, came on June 25 and 26 in Cincinnati and Indianapolis. 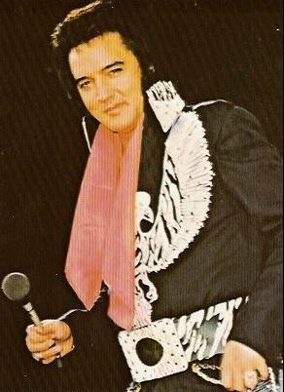 Despite disturbing reports of Presley’s declining health and recent bizarre behavior on stage in other cities, Cincinnati’s Riverfront Coliseum and Indianapolis’s Market Square Arena both sold out their capacities of over 17,000 for Elvis’s upcoming shows. In Cincinnati the doors opened 2 ½ hours before show time. Available for early arrivers were an assortment of Presley souvenirs, including posters ($3 and $5), programs ($3), buttons ($2), binoculars ($5), necklaces ($5), and belt buckles ($10). Other journalists in the audience confirmed Presley’s unhealthy appearance. In the Cincinnati Post, Brad Balfour observed, “Elvis ambled about the stage moving his bloated face and heavy bulk around woodenly.” Indianapolis Star writer Zach Dunkin teased, “Married men may have found an ally in Elvis Presley. Wives may figure so what if their old men have 42-inch waists and chubby cheeks.” Published photos of Elvis on stage have since confirmed what the reviewers described. Presley’s opening number, “C. C. Rider,” got the show off to a “flash-bulb-popping, hand-clapping start,” Rita Rose observed in Indianapolis. “His ‘Amen’ encouraged everyone to clap and sing along, bringing everyone together.” The playlist of about 20 numbers also included oldies “I Got a Woman,” “Jailhouse Rock,” “Teddy Bear,” “Hound Dog,” “Don’t Be Cruel,” “Little Sister,” and “It’s Now or Never.” Also included were songs Presley had recorded more recently, such as “Unchained Melody,” “You Gave Me a Mountain,” “Fairytale,” “Bridge Over Troubled Water,” and “My Way” (for which he had to read the lyrics off a sheet of paper). 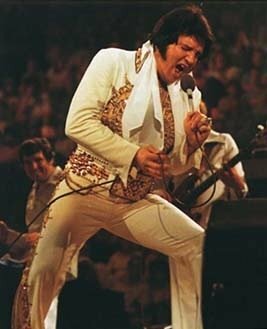 “Apparently the reports are founded upon truth, and the King confirmed the suspicions with his listless, lifeless performance Saturday night at Cincinnati Riverfront Coliseum before another sellout crowd … Gone from his performance is the magic generated by one of the world’s ultimate legends; gone is the energy and vitality of a healthy Elvis; gone is the beauty of the voice that charmed millions … I feared the worst for Cincinnati and the fears became a nightmare for me." 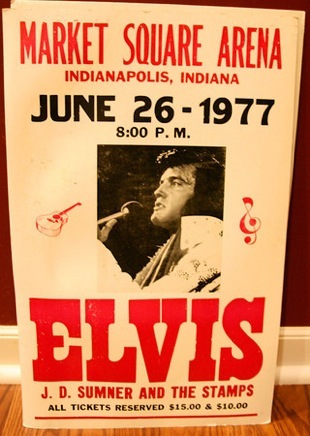 However, the passion evident in both arenas suggests that most of the 34,000 people who saw Elvis Presley perform on stage in Cincinnati and Indianapolis on June 25-26, 1977, cherished that final opportunity to see him perform in a live show, even though he was not at the top of his game, either physically or musically. Just to see him and hear him sing in person must have been a spiritual experience for the pilgrims from across the Atlantic, as well as for thousands of others who saw his final shows.